Erected by 8th Street Historic District, Manitowoc, Wisconsin. Location. 44° 5.396′ N, 87° 39.55′ W. Marker is in Manitowoc, Wisconsin, in Manitowoc County. Marker is on South 9th Street near Jay Street, on the right when traveling south. Touch for map. The building is located on the northwest corner. The marker is mounted on the side of the building facing South 9th Street. 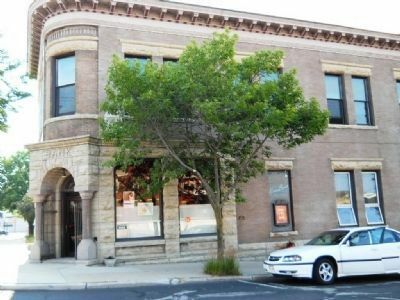 Marker is at or near this postal address: 902 Jay Street, Manitowoc WI 54220, United States of America. Touch for directions. line); Manitowoc Savings Bank (about 400 feet away); F.C. Buerstatte Pharmacy (about 400 feet away); Charles W. White Law Office (about 400 feet away); Manitowoc National Bank (about 400 feet away). Touch for a list and map of all markers in Manitowoc. More. 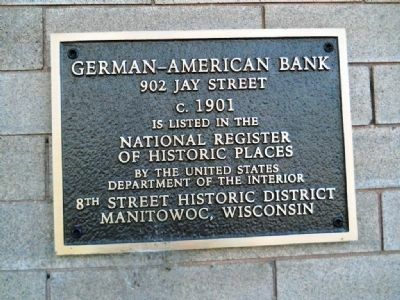 Search the internet for German-American Bank. Credits. This page was last revised on August 28, 2016. This page originally submitted on July 14, 2012, by Kent Salomon of Manitowoc,, Wisconsin. This page has been viewed 373 times since then and 5 times this year. Photos: 1, 2. submitted on July 14, 2012, by Kent Salomon of Manitowoc,, Wisconsin. • Syd Whittle was the editor who published this page.